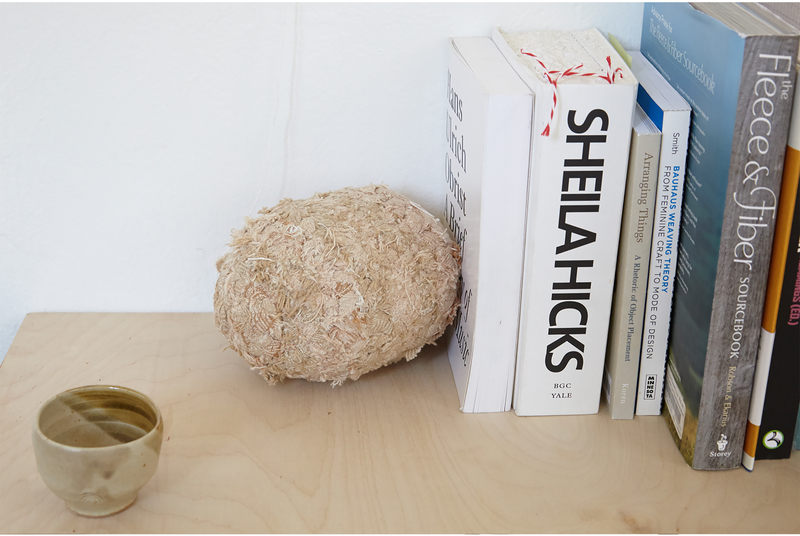 Oakland weaver and designer Adele Stafford creates work that mirrors the way she lives life: slowly, carefully, and rooted in intention. 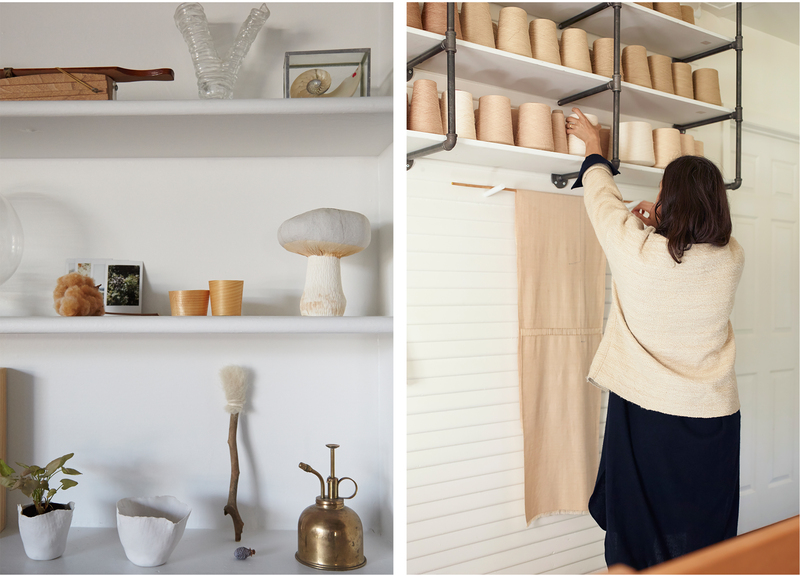 A RISD graduate, her textile line Voices of Industry is hand-sourced through farmers around the United States and hand-spun by Adele herself. Adele is a true inspiration, both through the work she creates but also through her ability to examine and articulate the value in living a life less conventional. Jumping right in — you’ve spoken before about the value of commitment to what you do, of the importance of showing up and clocking hours. Can you share more? The work I have always admired most emanates from creative minds who are also masters of their craft. I long ago rejected the notion of divine artistic talent striking some of us while passing over countless others or the idea that creativity can't be learned and honed. Forget genius. Instead, commit to the voice and vision you already possess and work really, really hard at making work that most genuinely reflects that voice and vision. I recently heard Sally Mann describing her work style as that of a peasant and I completely relate. The artists I am inspired by all work like peasants, day in and day out, in service to process, process as the work. The British painter, Frank Auerbach, was the first example to really drive this home for me as a young drawing student. He often works into the same drawing or painting for so many days on end that he has to replace worn out parts of the canvas; his final pieces are only final because his gallerist literally takes them off of his easel and leaves his studio. Weaving is rooted in repetition. 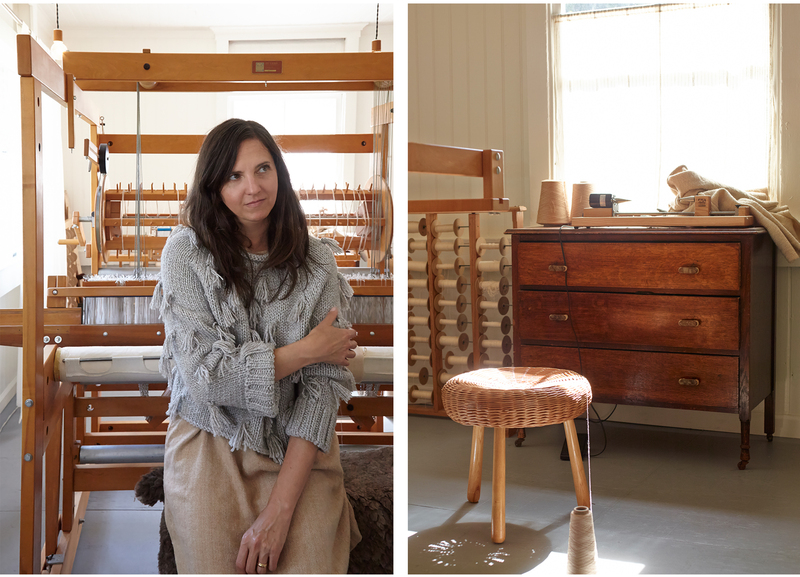 Can you share more about your time alone at the loom — how it serves you? Though the action of hand weaving is repetitive, each toss of the shuttle does have its own particular cadence and path. When weaving, I am extremely present with this building process, noticing the arc of each weft before it gets beaten into the rest of the cloth, the tension on the selvedge or the drag from the shuttle. This particular type of rhythm, repetitive and yet simultaneously singular, requires both flow and acute attention. Somewhere in the intersection of those two ‘modes,' I find a level of contentment that I've had difficulty finding elsewhere. What specific elements play into you getting into the right headspace to create — music, light, scent, time of day, temperature…can you elaborate on the specifics? I work most clearly and productively in the early morning and later in the afternoon. Five days a week, I head out for a morning run just after my coffee. I clear my head and ready my body for the physicality of sitting and weaving all day. Tea usually accompanies me to the loom, an ever changing line-up of tisanes from our little herb patch. When I listen to music, I usually opt for classical, particularly obsessed with anything composed by Benjamin Britten. I am also a serious podcast nerd. I eagerly devour the weekly show from The Longform Podcast. You in many cases are working with materials that you’ve sourced from the field to the loom. How does seeing the materials in their original, raw state affect how you work with them and interpret them into your own designs? The origin of materials is really what my work is all about, both the literal land where it was grown and the story of the stewards who brought it into being. Being in the field with the fiber is essential in considering the cloth it will become and generates an early set of questions that guide the design process. I am particularly curious about design details that might emanate from a field's particular horizon line, the spacing between rows of crops, seasonal plants that show up, months later, in the wool of a sheep. All of these environmental details start to shape a story, one that I aspire to capture in the final garment. What inspires the shapes and pieces that you make? Specifically thinking of things in a more abstract way: books, concepts, places, art? The final form of a garment is derived from two main sources; the particular desire of the cloth and the spirit of the story I am trying to tell. This last collection of work from West Texas organic cotton produced a buttery, luminous cloth that feels like an 'elevated muslin.’ It wanted to be dead simple in terms of silhouette. Simultaneously, the spirit of these farmers and the history of that part of the country begged for classic garment construction and details; the classic white T-shirt, the baseball jersey with selvedge gussets — shapes that feel very American in their ubiquity as everyday ease. What is your perspective on the textural, visceral, slow nature of your work versus the two-dimensional, digital, fast-paced, and content-driven reality of how mainstream society operates? I started Voices of Industry after exiting the corporate design sector where all I talked about was interaction design, software development and apps, apps, apps. I was so ready to return to a tangible practice that was grounded in all things real. I haven't looked back except to wonder, a bit bewildered, that I ever veered away from the type of work that I am now doing again. I think that there is truth in a backlash to the overwhelming role technology now plays in most of our lives but I also believe that the tangible, slow nature of hand work has always fascinated a certain type of person and those are the people I find good resonance with. Are there any people in a similar field to you that you draw inspiration from, or who you feel paved the way for you to do what you’re doing now? 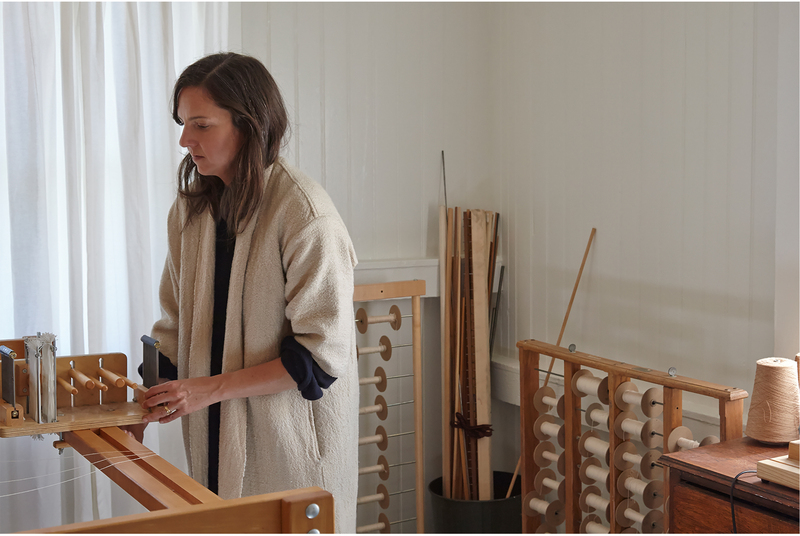 I am fortunate to have the magnificent work of weavers like Anni Albers, Gunta Stolzl, Kay Sekimachi, and Lenore Tawney to follow in my pursuit of high craft. Similarly, I am very inspired by the sculptural work of Eva Hesse, Louise Bourgeois, Ann Hamilton, and Kiki Smith, female artists whose tenaciousness in pursuit of their vision is unparalleled. In contemporary terms, I admire the generosity of many of my fellow weavers with whom I correspond, carrying on a rich tradition of 'the guild.’ My modern-day heroes are mostly farmers, like Sally Fox and Wendell Berry, who have committed to a life of stewardship on their particular plot of land, a life that demands much and offers a richness of being rather than things. Can you suggest three favorite spots in Oakland — food, outdoors, art, culture, etc — and what you like about them? Camino is our very favorite place to eat with its wood-fired open hearth and oven. Russell Moore and Allison Hopelain do a tremendous job of working with small farmers, coaxing simple, sometimes meager, ingredients into delicious food free of pretense, rich with preparation and tradition. I run through Mountain View Cemetery most mornings of the week and still consider it a gem in the thick of our urban landscape. Frederick Law Olmstead designed it as the first perpetual care cemetery on the West Coast and there are many legendary families buried there including the Hearst's and Ghirardellis. Sweeping vistas abound if you work your way to the top; a 360-degree view including the San Francisco skyline, the Golden Gate Bridge and Marin. For art, I adore the work underway at Creative Growth, an organization that offers arts education, studio support and jobs to adult artists with mental, physical and developmental challenges. I haven't seen more inspiring work in a long, long time. What was the last great thing you read? What’s something you’ve re-read multiple times? I'm almost finished with Sally Mann's memoir, Hold Still, and am intentionally limiting the number of pages I read each night to make it last a little longer. I recently read H is for Hawk and loved the parallel between grief and the goshawk. I return often to the writing of Cormac McCarthy, David Foster Wallace, and Lorrie Moore. What is on the front-burner for you right now — can you share five things you are currently interested in: an idea, an artist, a cocktail, a new walking route, a texture, a color palette…..
1. Recently back from a research trip to the Navajo Nation, the Churro sheep is constantly top of mind with their wildness and ancient energy. 2. Perfecting the savory crepe, my new favorite dinner. 3. Rug weaving technique, specifically Peter Collingswood's legacy. I see a rug loom in my near future. 4. The lake my family visits every summer in Hendersonville, North Carolina. 5. Darning my husband's jeans using a combination of machine and hand stitching; how to balance function and aesthetic. Goat or sheep milk yogurt, toasted quinoa, dates, toasted sunflower seeds and a drizzle of olive oil. Perfection, as inspired by Sitka and Spruce in Seattle. What is your daily “uniform”? I prefer to wear loose pants while weaving and have accumulated a bevy of drop crotch linen and cotton pairs. A Voices of Industry drawstring pair of pants is in the works! I tend to wear one of my hand woven t shirts on top, hair pinned up with a gold barrette and barefoot to be as gentle as possible on my loom's wooden pedals. Bathing has always played a strong role in ritual for me, a time to be very quiet and contemplative or indulgent in a piece of literature or nonsense magazine. With the drought in California, I haven't felt emboldened to fill up the tub for a bath so I've been attempting to take a 30-minute nap instead, just after lunch, my bassett hound curled up and snoring next to me. Honestly, most often with a lovely glass of wine. My husband and I have gotten pretty skilled at old-school cocktail hour, sitting down in the living room or on the porch with a glass of wine and a bowl of toasted nuts. We catch up for about a half an hour and then get started on dinner.